There is no doubt we are living in a time of increasing complexity and intensity. Whether it is the current tensions in “hotspots” around the globe, struggles in communities close to home, or businesses trying to navigate not just marketplace competition and economic trends, but the significant social and political changes within their areas of operation. Even though they don’t make the front page news, we also know there are underlying tensions in the home that then manifest themselves in actions we do see in our schools, communities, and workplaces. With the increasingly complex problems around us we have a tendency to become overwhelmed and sometimes paralyzed with the sense that the challenges are insurmountable. In a real and practical sense, the complexities we see are not the result of some “community” behavior, “society” behavior, “organizational” behavior, or even “family” behavior. They are the result of individual choice and the behaviors that stem from those choices. A community’s culture, an organization’s culture, a family’s culture simply and practically flow from individual behavior. The only real individual behavior we have control over is our very own. We are free and accountable to behave in response to the situation around us. Our individual behavior is where change begins. When we look across the history of time, we see individuals that are the catalysts for change. Not technologies or mass moments, but individuals are the genesis of driving change. There are the great examples we read about like Gandhi leading change in India without ever holding public office. Churchill galvanizing the British people during time of war. Ronald Reagan as the catalyst for driving change to end the cold war. On the business front, we read about Lou Gerstner turning around IBM in the 1990s, Steve Jobs coming back to Apple and driving the next great wave of innovation, and Elon Musk spearheading great technical advances with Tesla’s electric cars and space travel. However, the most important actions of people becoming the catalyst for change are those we don’t read about in the papers or on the internet. They are the actions of individuals in the home. The individual behaviors of parents, grandparents, and children within the home has always been the greatest catalyst for change over time. It is the behaviors within the home that day in and day out set the tone for the next 8 hours in the classroom, the workplace, the community. Those behaviors in the home, collectively over time, form the foundation for individuals to step up and meet the opportunity on a much larger scale and become the catalyst for the really big changes we will eventually read about in newspapers and in history books. Driving major change around the world and around our community is about individuals being the catalyst and those individuals are first and foremost impacted by behaviors in the home. We all have our roles to play. Some of us are playing direct, major roles right now in dealing with the complexities we see all around us. However, for the vast majority of us, our best effort to impact these large complexities can be brought down to clear and simple steps we can start in our homes and with our families. Our character, the internal compass that drives our thoughts, decisions, and actions, is the starting point for those important behaviors in the home. As we build and strengthen our character with behaviors based on honesty, respect, understanding, courage, compassion, and discipline, we will create the foundation to encourage others in the home to act based on those principles in school, the workplace, and the community. Eventually some of them will drive positive impact on the world’s stage. When the complexity of this world begins to feel overwhelming, we should all remember the role we can play to drive change begins simply and clearly in the home. As we guide our thoughts, decisions, and actions by principles, we will build and strengthen our character and Character Creates Opportunity® to improve the world around us. (1) For those who are currently in a tough struggle to reach a goal and anxiousness, worry, and doubt are draining precious energy. My hope is that this will be an encouraging reminder of the truth that education and effort are the foundation of achievement. Reaching a goal is not about being the smartest, having the best connections, or just plain luck. Education and effort will play to our favor in the long haul, so keep moving forward on those two fronts no matter how tough the present struggle. (2) For those who still maybe holding out hope that there is that secret, quick-fix formula out there to reach our hopes and dreams. My hope is that this blog could be a sobering reminder to you and those you influence that the secret, quick-fix to the important things in life is not a reality. Education and effort will always play a part in the foundation for achievement. 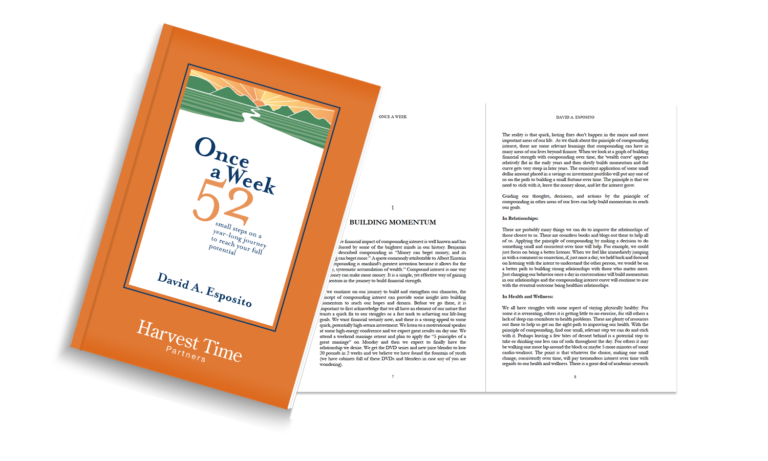 There is a great deal written about, discussed, Facebook status updates provided, and testimonies given about the various disappoints, discomforts, and sufferings we endure during our journey of life. However, many of us would classify some of these sufferings as almost too much to endure, like the untimely death of a loved one, a parent holding the hand of a terminally ill child, the heartbreaking destruction of a once close family, or the addiction that resulted in a tragic ending. Although we all hope to avoid a great deal of pain and suffering in this world, the reality is that we all will endure our share of suffering. Most of us will find a way to carry-on, some in silence and some with a loud roar. There is no escaping disappoint, discouragement, and suffering. Our natural pathway to addressing suffering is to rally our own strength, perhaps we are fortunate to gain some encouragement from others, and we endure with the hope that we will continue to grow stronger through the experience. As a point to reinforce the importance of building and strengthening our character, it is helpful to highlight the other side of suffering. The other side of suffering, the other side of enduring the pain, is an opportunity to grow in empathy towards the suffering of others in order to be a genuine and relevant source of comfort to those in need. When we walk through the valley of suffering, as opposed to growing bitter, we have an opportunity to deeply understand the suffering of others and reach out to help others find comfort in their own troubled time. Those who have endured a particular hardship are very often the most helpful to relate to the needs of those dealing with a similar struggle. (2) Act on an opportunity to make a connection with someone who is enduring a similar struggle to our own. (3) Grow stronger, not just by enduring our own struggle, but also by the truth that being a comfort to others grows our own capacity to live a more abundant life. As we use the experience of our own suffering to aid others in need, we build and strengthen our character and Character Creates Opportunity® to have a positive impact in this world. Life is meant to be lived in relationships. We cannot live life alone for any significant length of time without becoming unhealthy emotionally and then physically. An important factor in our own health is the presence of others. In addition, any meaningful achievement in business, communities, or our world, was accomplished with people working together. We all enjoy those moments of relationship with others when times are easy going and comfortable. Many of us can relate to the joy of having a cup of coffee or a glass of wine with a close friend or loved one when life seems a bit settled. In addition, when we are in a difficult struggle, the companionship of someone who understands and cares is a huge source of strength during our time in need. Like many experiences in life, relationships provide insight into our character. It is often the difficult side of relationships that can be most revealing to us and a place where we can learn and grow. Most of us have been around the proverbial “block” a few times. We have come to realize that all meaningful relationships have a fair amount of struggle and the fairy tale notion of “happily ever after” is not reality when life is in a constant state of significant transition in the home, the workplace, and the community. Transitions bring new experiences and new experiences are a powerful door opener to stress and strain in relationships. When relationships are strained (the unfortunate reality is they will be strained at some point), we have a real opportunity to build and strengthen our character. Our effort focused on how we respond during that critical time has the potential to make all the difference in the survival or the demise of the relationship. We probably can always find some fault on “the other side” of the relationship. If we are honest with ourselves, they can always find fault on “our side” too. There is little to no benefit in playing the blame game. When our response, during times of struggle, is focused on patience (which is defined as long suffering by the way), understanding, and a desire to genuinely find a “better way” together, we will more consistently see the relationship survive the struggle. In addition, like any good workout routine, our strength to endure future struggles will be increased as our “muscles” get stronger with the workout. 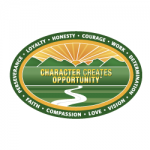 As our thoughts, decisions, and actions are focused on rising above our situation and responding with patience, understanding, and genuine desire to find a “better way,” we will build and strengthen our character and Character Creates Opportunity® to build healthy and meaningful relationships. As we journey back to school in the fall to continue our education, as businesses fine tune plans to finish the year strong, and as schedules get a little more jammed with activities, we will most likely face a few struggles in these transitions and we have an opportunity to strengthen relationships, especially those closest to us.